The decision by the United Kingdom to leave the European Union – known as Brexit – shines a spotlight on the divisions in public opinion between the UK and the continental members of the EU, and within the UK on a range of issues relating to the future of Europe. The June 23 referendum – in which the public voted 52% to 48% to leave – is a reminder that the British have never been as enamored with the EU as most of their continental counterparts. Britons have criticized the EU for its handling of a range of issues, resent the loss of power to the Brussels-based institution and are divided among themselves about the institution they first joined in 1973. More broadly, a Pew Research Center survey conducted this spring found that publics in a number of other EU countries share the British desire for a less, not more, centralized Europe, and that the debate about the future of the EU will not subside just because the UK has now voted. 1 The EU has never been as popular in the UK as it has been among other EU members. Just 44% of the public in the UK has a favorable view of the EU, compared with a median of 50% who hold a favorable opinion in five other EU nations surveyed by Pew Research Center. Support for the EU is down in the UK from a high of 52% in 2014. British views of the EU have consistently been lower than those on the continent for nearly a decade. 2 The British have long thought that the EU was inefficient and intrusive and has mishandled the challenges facing Europe. 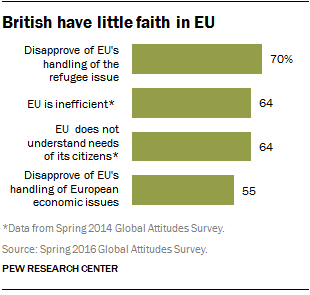 In a 2014 Pew Research Center survey, 64% of the British thought the EU was inefficient and does not understand the needs of its citizens. Six-in-ten said it was intrusive. In this year’s survey, 70% in the UK disapprove of the EU’s handling of the refugee issue and 55% said the same about the EU’s dealing with economic issues. 3 The vote to leave reflects the desire of nearly two-thirds of the UK public to bring back some EU powers from Brussels to London. 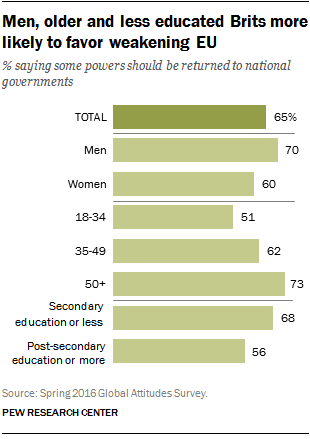 Fully 65% of the British said before the referendum that they wanted some EU powers to be returned to their national government. This included 73% of those ages 50 and older, 70% of men, 68% of those with a secondary education or less, 93% of UK Independence Party supporters, 77% of Conservative Party adherents and 49% of Labour Party backers. 4 The Brexit vote exposes a rift in public opinion between the Scottish and people in the rest of the United Kingdom. The Scottish voted to stay in the EU by an overwhelming margin of 62% to 38%, putting a new Scottish independence referendum on the table. Pew Research Center data show that the Scottish are more likely than those in England, Northern Ireland and Wales to have a favorable opinion of the EU (53% versus 43% respectively). Scotland also disagrees with the rest of the UK on two issues central to the Brexit debate: the economy and immigration. The Scottish feel more threatened by the prospect of global economic instability than their counterparts in the rest of the UK. Roughly six-in-ten say it is a major threat to their country, while only 48% say the same in England, Northern Ireland and Wales. Meanwhile, the rest of the UK feels more threatened by the large number of refugees leaving countries such as Iraq and Syria (54% major threat). Just 41% of Scottish people agree. 5The rest of Europe sees Brexit as pivotal for the well-being of the EU. Before the referendum, a median of 70% said that they thought it would be a bad thing for the EU if the UK were to leave. This included 89% of the Swedes, 75% of the Dutch and 74% of the Germans. 6 The debate in other EU member states about the future of the institution may just be getting started. A majority of the Greeks (68%) and pluralities of the Dutch (44%), Germans (43%), Italians (39%) and French (39%) all want some EU power returned to their national governments. Both the Dutch and the French have a history of holding referendums on major and not-so-major issues, and Euroskeptic parties in both countries have already voiced support for a public vote on their relationship with the EU.